Latin America has the highest murder rates in the world for people aged between 15 and 24, according to a study by a Brazilian research group. Using data from 83 countries, the group found that the probability of a young person being murdered in Latin America is 30 times higher than in Europe. The grimmest figures are for El Salvador, where the murder rate among young people is 92 per 100,000 people. 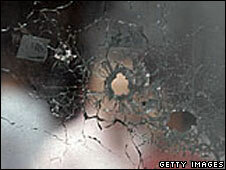 A key factor there is the presence of violent youth gangs, the report says. The study, called Map of Violence: The Young People of Latin America, was compiled by researchers at the Latin American Technological Information Network, Ritla. The Brasilia-based group compared murder rates for 2007 in 83 countries, both for the overall population and for the 15-to-24 age bracket. "The probability of a young Latin American being a murder victim is 30 times higher than for a European, and more than 70 times greater than for young people in countries like Greece, Hungary, England, Austria... or Ireland," the report said. The comparative study found that the murder rate for young people was 36.6 for every 100,000 people in Latin America while in Africa it was 16.1, North America 12, Asia 2.4, Oceania 1.6 and Europe 1.2, although there are variations within a particular region. The report also found that the top four countries for youth murder rates also headed the overall murder rate table: El Salvador (total murders per 100,000 - 48.8), Colombia (43.8), Venezuela (29.5) and Guatemala (28.5). Brazil occupies fifth place for youth murders and sixth for the overall murder rate at 25.2. The lowest youth murder rates in Latin America were in Chile, Cuba and Uruguay, all with around seven killings per 100,000. The Ritla report notes that as well as El Salvador, Nicaragua and Guatemala have also seen what it calls "drastic" increases in murder rates. Part of this is due to the presence of youth gangs, known as maras, which are prevalent in Central America. But the study says the region also has a long history of armed internal and external conflict.